In traditional times, the Gurukul (literally translated as the master's domain) was where disciples lived and worked to gain the knowledge and blessings of their Guru. In the spirit of this intimate tradition, sitar maestro Pandit Krishna Bhatt offers students a chance to study the nuances of Indian classical music. 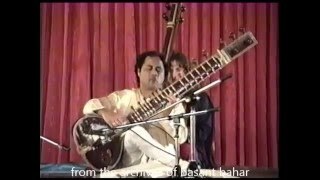 Each summer he returns to New York City to teach students the techniques and compositions of the Maihar Gharana (school) of the legendary Baba Ustad Allaudin Khan.